Jen Sorensen’s comics and illustrations have appeared in the The Nation, NPR.org, Ms. Magazine, The Progressive, Politico, Daily Kos, Fusion, The Nib, AlterNet, Truthout, MAD, Nickelodeon, The Los Angeles Times, The Austin Chronicle, The Village Voice, In These Times, The Book of Jezebel, and dozens of other publications around the country. She has created commissioned long-form comics for the ACLU, NPR, Kaiser Health News, The Oregonian, and other clients. Her work has won many accolades. She was a 2017 Pulitzer Finalist in Editorial Cartooning. In 2014, she was awarded the Herblock Prize, an award endowed by the legendary Washington Post cartoonist Herb Block, as well as the Sigma Delta Chi Award from the Society of Professional Journalists. In 2013, she was the recipient of a Robert F. Kennedy Journalism Award, and she also won the National Cartoonists Society Award for Best Editorial Cartoons. In 2012, she was named the Herblock Prize Finalist. In 2010 she received an Aronson Journalism Award from Hunter College in NYC, and in 2000 she won a Xeric grant to publish her first collection of strips. She has also won numerous awards from the Association of Alternative Newsweeklies, including First Place in the Cartoon category in 2014. In 2015, Sorensen was given an Inkpot Award for career achievement in comic arts from the San Diego Comic-Con International. Jen serves on the National Advisory Council of the Billy Ireland Cartoon Library and Museum at Ohio State University. She is also a member of the Association of American Editorial Cartoonists and the National Cartoonists Society. 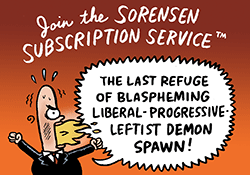 Sorensen has given presentations at the Ohio State University Library Festival of Cartoon Art, Netroots Nation, the Rhode Island School of Design, the Hammer Museum in Los Angeles, and the Center for American Progress. In 2015, Sorensen was invited to represent the US as a juror at the Aydin Doğan International Cartoon Competition in Turkey. She also judged the New York Times Learning Network’s student editorial cartoon contest in 2015 and 2016. 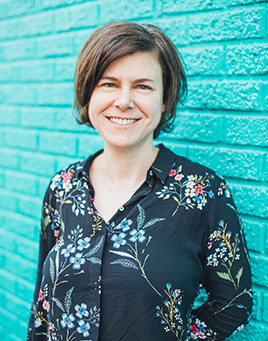 Jen grew up in Lancaster County, Pennsylvania, and went on to attend the University of Virginia, where she studied cultural anthropology and drew cartoons for college publications. She started her weekly strip in 1998, which quickly became political as the 2000 election and 9/11 dominated the national conversation. Additional fun facts: Jen was once clue “12 down” in the Time Out New York crossword puzzle and her work made cameos on the “Queer as Folk” television series.